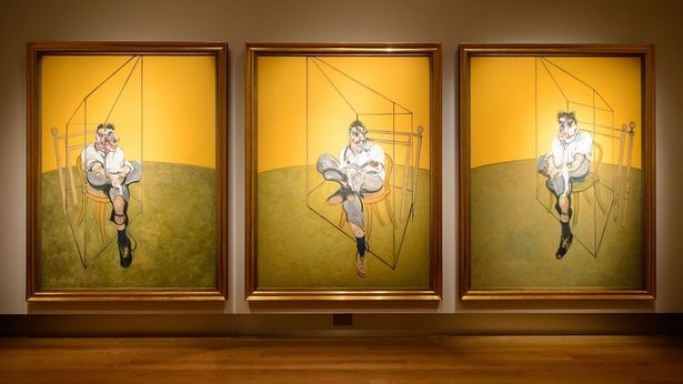 Sold within six minutes in the world’s most expensive auction in history, Francis Bacon’s three-panel painting "Three Studies of Lucian Freud” broke the record for being the most expensive piece of art ever sold, fetching $142.4 million. The previous record for the most expensive artwork sold in an auction was that of Edvard Munch's "The Scream" which sold at $119.9 million in 2012 at Sotheby's New York. Christie’s was also able to amass $691 million from the 69 post-war artworks sold, the highest total for an art sale in history. Out of the 69 artworks, only six failed to sell. Also, the sale broke another record for a price achieved at auction by any living artist after Jeff Koons' large sculpture "Balloon Dog (Orange)" was bought for $58.4 million. It surpassed that of Gerhard Richter's "Domplatz, Mailand (Cathedral Square, Milan)" sold in May for $37.1 million. Painted in 1969, "Three Studies of Lucian Freud” features Bacon’s fellow painter Lucian Freud perched on a cane-bottomed wooden chair within a cage with a solid orange background. Lucian is the grandson of psychoanalysis founder Sigmund Freud. The pair shared a friend-rival relationship since mid-1940s. "It is a true masterpiece that marks Bacon and Freud's relationship and their creative and emotional kinship," according to Christie’s. Acquavella Gallery was the lucky bidder, assumed to be bidding behind an anonymous client. "Our top collectors bid very, very aggressively for the best of the best," said Brett Gorvy, Christie's head of postwar and contemporary art. "I really believe we are beginning something. This is not a bubble." "In the past three to four years, the market for great modern art has become global," Jussi Pylkkanen, president and chairman of Christie's Europe told Reuters. “The record sale in May was a marker for collectors of masterpieces," he said. Other highlights of the auction include Andy Warhol's "Coca-Cola (3) sold for $57.3 million, Mark Rothko's No. 11 (Untitled) bought for $46.1 million and Willem De Kooning's "Untitled VIII" set an artist's record with $32.1 million. Bacon's 1976's "Triptych" was the most expensive painting sold for $86.6 million in 2008.